The week has finally come to an end with a good number of gambling degenerates from the poker world glued to the television watching, betting, cursing the NCAA Men’s Basketball Tournament. It’s a fun time of year for those who like to diversify their gambling dollar but not so much for those on Twitter who only endorse messages about things which interest them. This week saw Ray Henson win his 2nd WSOP-C ring of 2013 at a place called The Lodge in Colorado (not to be confused with the old Pokerati games at The Lodge back during the golden old days). The WSOP-C Main Event is now underway with 3 starting days and a $1,675 buy-in. Also underway is the overly-complicated PartyPoker Premier League VI in London featuring a ton of your favorite players and a super live stream with Kara Scott. The only outcome noticed so far was a bad beat on Daniel Negreanu to send him back to Vegas before the WSOP-APAC. It seems like IveyPoker and Nevada are in a race to see who can have the largest group of people doing nothing. Highway to Hell – An interesting read about old school gambling in Texas along the Jacksboro Highway complete with stories/quotes from Doyle Brunson. Parx Takes Lead In Monthly Poker Revenue – As an east coast boy I find this pretty shocking. When Pennsylvania began opening casinos and card rooms, everyone shrugged their shoulders saying it would have little impact on the games in AC. I guess they might have been wrong and kudos to Matt Glantz for getting Parx ahead. Phil Ivey To Captain Team Americas in WSOP Asia-Pacific Caesars Cup – The WSOP Asia Pacific series is just a few weeks away and they’ve announced the captains for the latest effort to make the Caesars Cup something interesting. Phil Ivey (Team Americas), Sam Trickett (Team Europe), and Joe Hachem (Team Asia-Pacific) will now “draft” their teams. Vertical Rush from PokerStars.com – I’m not exactly sure what I’m watching in this video other than it’s a bunch of people running up 42 floors of some building in London, includes Liv Boeree, and appears to have been recorded using mid-1990’s video technology. Four open event bracelets have been awarded so far this summer and there have already been some impressive final tables. 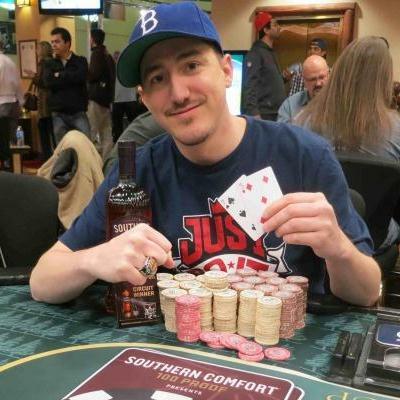 Fan favorite Brent “Bhanks11” Hanks won his first bracelet at a final table which included Vanessa Selbst, Jacob Bazeley, Andrew Badecker, and JP Kelly. The Stud Hi/Lo tables featured Michael “The Grinder” Mizrachi, Todd Brunson, and Chris Bjorin while the Pot Limit Hold’em had none other than Old Kid Poker Negreanu, Tommy Vedes, and Jon Aguiar. Just one bracelet to be won today and the $1,500 Stud has the biggest names atop of the leaderboard. David Williams leads followed by Andy Bloch and Barry Greenstein. $126,363 for first place and a fancy bracelet. 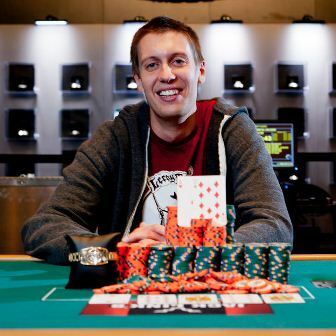 Bloch is trying to get off the confounded “best players to not have won a WSOP event” list. Aside from the action inside the Rio, it seems like a battle was being fought in the suburbs at the house warming party of Vanessa Rousso, Liv Boeree, and Maria Ho. Missing this party was one of my regrets in hitting Vegas a week late but I might have saved myself a little pain. At last report, at least 5 people ended up on the injury report including Ryan “g0lfa” D’Angelo and hostess Liv Boeree with a nasty looking ankle injury. Lesson for the kids, don’t get drunk and try to do backflips. Tweet o’ the Day – Brought to you by @AllenBari who is not generally known for doing anything other than complaining and bragging. Also for winning a crap ton of money, but mostly the complaining and bragging. Pro-spective with John Monnette – The (top notch and very slick) BLUFF Magazine video team sat down with John Monnette, who explains how a dealer error in the Stud Hi/Lo tournament may have cost him a shot at the bracelet. Why Female Players Will Break Through at 2012 WSOP – Another WSOP, another article looking at how women will perform. Things are looking great so far with Vanessa Selbst and Xuan Liu making final tables and Annette Obrestad’s deep run in the Mix Max Event. WSOP 2012: Welcome Back to the Rio – Kristy Arnett and Sarah Grant from PokerNews take a walk around the empty Rio Convention Center. While the media lay down a carpet of solid adulation for Pius Heinz, the world’s wheels keep on turning. Join me, as we find out what’s been swept under the global news carpet while the world’s latest millionaire was parading about in his jangly new wrist ornament. I’m off to search London for a Wispa Gold, the confectionery equivalent of a WSOP bracelet. I’ll keep my beady eye peeled for any stray bits of news that are blowing across the pavement, while you keep your gaze fixed firmly on Pokerati. I’ll know if you move. The 2010 WSOP Europe at the Casino at the Empire in London held their first bracelet event this afternoon, the Â£2500 + Â£150 NL Holdem 6-max event. The field had a cap of 204 players, selling out the tournament, however alternates were accepted, eventually creating a field of 244 entrants, with the final 24 making the money. 31 players will return at 2pm London time Wednesday (updates at PokerNews and WSOP.com), playing down to the final 6 players. Andrew Pantling leads the field with 106,100 in chips. Other notables returning: Chris Bjorin (103,800), Chris Moorman (94,200), 2007 WSOPE runner-up John Tabatabai (69,900), Phil Laak (63,600), Jeff Lisandro (55,500), Praz Bansi (49,300), Liv Boeree (27,700) and Andrew Lichtenberger (19,900). Full seat assignments available here. Six players remain at the $5,000 No-Limit Holdem 6-max final table with Jeffrey Papola (2,340,000) leading when play resumed at 9pm. The rest of the final table is made up of Erick Lindgren (1,670,000), Men Nguyen (1,505,000), Orlando Delacruz (1,100,000), Bruno Launais (1,003,000) and Mark Radoja (480,000). Follow the action at PokerNews. Eight players remain in the $2,500 Pot-Limit Omaha/Pot-Limit Holdem final table with Jose Luis Velador (985,000) holding the chip lead. Kevin MacPhee (631,000), David Chiu (437,000), Rob Hollink (323,000), and Victor Ramdin (200,000) are the notable names remaining, follow the action at PokerNews. The $10,000 No-Limit Holdem Heads-Up Championship is currently at round 4 with players now in the money. Among the round 4 winners: Faraz Jaka, Bertrand “ElkY” Grospellier, Brian Rast, Kido Pham, Ludovic Lacay and Jason Somerville. One more round is scheduled for 11pm tonight, with the 8 survivors playing to a winner Sunday afternoon. See who else moves on at wsop.com. Less than 150 players remain as play continues on day 2 of the $1,000 Seniors’ No-Limit Holdem Championship with Duane Gerleman (210,000) reported as the chip leader. Other notables in the hunt: Team Pokerati/Loudmouth Poker pro Tom Schneider (181,000), Berry Johnston (110,000), Susie Isaacs (60,000) and John Spadavecchia (55,000). Find more info over at wsop.com. A field of 2,485 1,987 started day 1a of the $1,000 No-Limit Holdem with around 550 players remaining, scheduled to play 10 levels or down to about 360 players, whichever comes first. Notables who’ve grown their 3,000-chip stack: Scott Montgomery (25,000), Liv Boeree (24,700), Neil Channing (18,000) and Lee Childs (11,000). More updates and chip counts can be found at PokerNews. The 5pm tournament today, $3,000 HORSE, drew a field of 478 entrants with the top 48 making the money, with the winner earning $329,840. The early leader is Robert Willamson III with 16,000 in chips, followed by Andre Akkari (13,000), Shaun Deeb (12,500), Matt Savage (11,700) and Scotty Nguyen (10,500). More updates as eight levels of play is scheduled at PokerNews. The tournament will be filmed for the online version of WSOP Academy, with commentary provided by Ali Nejad and Phil Hellmuth. You can also follow the action as it happens on WSOP Academy’s Twitter. More information can be found at WSOP.com. The $5,000 No-Limit Shootout final table with Joshua Tieman eliminating the final four players to take down the coveted WSOP bracelet, along with $441,692. 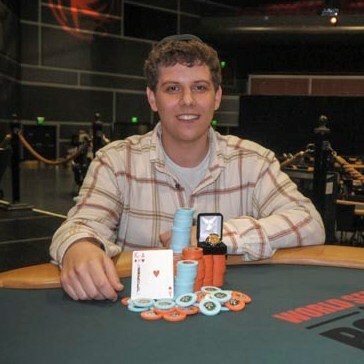 Tieman disposed of veteran British pro Neil Channing in heads-up play, earning $273,153 for Channing. Stuart Rutter ($179,617), Joseph Elpayaa ($125,387), Nicolas Levi ($92,543) and Brent Hanks ($71,998) rounded out the final table results. The $2,500 2-7 Triple Draw Lowball is down to three players with Raphael Zimmerman the chip leader (865,000), followed by Dan McNamara (675,000) and Peter Gelenscer (612,000). David Chiu ($50,517), Jameson Painter ($34,843). and Leonard Martin ($24,723) were the others at the final table. Follow the action over at PokerNews. The $1,500 No-Limit Holdem event is down to under 80 players as the field is now at their one hour dinner break. The chip leader is Jose Gatmaitan at 350,000. Notables with chips: Josh Schlein (196,000), Matt Stout (150,000), Phil Hellmuth (145,000), and Steve Sung (85,000). The field returns to play five one-hour levels or reach the final table, whichever happens first. Follow PokerNews to get all the latest updates. The first tournament to start on Thursday, $1,500 Pot-Limit Holdem starting with a field of 650, with under 200 remaining when they return from their 90-minute dinner break to play four more one-hour levels. The final 63 players in the field cash, with the winner earning $197,470. Chad Batista is the current chip leader (52,000), followed by notables Justin Bonomo (32,000), Liv Boeree (26,500), Team Pokerati’s Tom Schneider (22,000) Lex Veldhuis (17,000) and Eric Froehlich (15,000). The $10,000 Seven Card Stud World Championship got underway at 5pm this afternoon, with a field of about 148 when registration closed. Yuval Bronshtein has already doubled up his starting stack of 30,000 to take the early lead. He’s followed closely by Daniel Negreanu (51,800), Robert Mizrachi (49,000) and Scotty Nguyen (35,000). For updates and a full list of entrants, check out wsop.com for more information. If you missed it last week, one of our more astute hirsute co-panelists on The Poker Beat was break-dancing the fine line between news and conspiracy theory in analyzing the changing legal landscape of poker and what it means to the business we all dabble in. The arrest of Daniel Tzvetkoff had something to do with that. Also BJ and Gary look at actual numbers in comparing/contrasting the WPT to the EPT. All while assessing whether or not PokerStars is taking over the world. Plus Liv Boeree kicking arse as Huff celebrates the glorious life of Gang Starr. Will the WPT get its own female champion? Meanwhile at the WPT World Championship, Heather Sue Mercer started Day 4 second in chips (1,364,000) with 35 players remaining. The only woman to win a non-ladies WPT event was Van Nguyen’s win at the sorta-open 2008 WPT Invitational. Among other notables remaining when play resumes at noon PT: Shawn Buchanan (1,841,000), Billy Baxter (887,500), Faraz Jaka (856,000), Phil Hellmuth (806,500), David Benyamine (731,000) Carlos Mortensen (586,000) and JJ Liu (495,000). Follow the live updates over at the the World Poker Tour site. Check it out … Rising poker diva Liv Boeree is in the December issue of British Maxim, which just recently went up online. While some in poker may scoff at her mere $200k in lifetime tournament winnings, hey, there’s not an online poker site in sight on this photo shoot, and yet Maxim is still interested enough to show sexually suggestive pictures of her ask about her life on a farm rolling around in mud? That’s pretty cool. We also learn she’s a total metal chick. Like she can actually rock out to Pantera on guitar. Dude. Go Liv Boeree … Win stuff! ALT HED: Liv Boeree has never masturbated a pig. It’s true. She says so herself. Read it. Layne Flack to Referee Boeree vs. Castillo? I kinda like the ridiculousness of it and would certainly stop and watch if I happened to be passing by a contrived Boeree vs. Castillo brawl. And ever since The Real Deal closed, poker seems to have been lacking a little ThÃ©Ã¢tre de l’Absurde. Boeree vs. Castello to be canceled? Though at the moment I’m a tad gun-shy about reporting things that have no official confirmation yet, I know good info from a good source when I hear it … and since none of the principals from PokerNews (who is sponsoring the event) are within shouting distance, my cell phone battery is near-dead, and Nevada Gaming Commission officials are done til morning … fuggit, I’l run with the notion that this boxing match between pro-ess Liv Boeree and PokerNews vid-chick Melissa Castello may or may not happen. Competitive boxing, of course, is highly regulated in Nevada — and when you mix a prize into the fight, apparently a whole new set of laws and licensing procedures come into play. I suppose it’s plausible they could restructure it with just a matter of pride at stake … but we’ll see. Anyone wanna make some online wagers about the outcome?